Parmo is a dish consisting of a fillet of breaded chicken, pork, or other meat that is fried, topped with béchamel sauce and cheese, then grilled and typically sold as takeaway food. A night out in Middlesbrough wouldn’t be complete without a take-out parmo. Middlesbrough is famous for the local take-away delicacy served up until the early hours of the morning, especially after a night out on the town. A parmo is a variation on a chicken parmesan, invented in Middlesbrough. 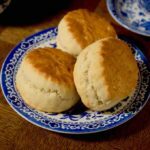 You can enjoy it in restaurants, as a take-away snack or at home with the recipe below. 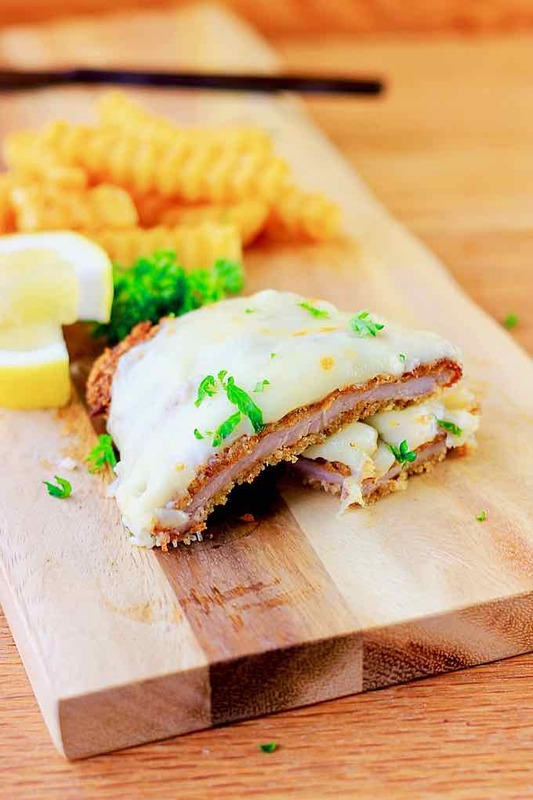 Whereas chicken parmesan is a flattened slab of chicken, pan-fried while coated with breadcrumbs and then grilled with parmesan cheese, a parmo involves deep-frying the chicken in an egg and breadcrumb batter, then smothering it in Béchamel sauce, before finally grilling with cheese. What is the history of parmo? There are loads of theories about the beginnings of the parmo, although the one that concerns an Algerian student who had a bad case of the munchies one night and created a dish out of the random contents of his fridge is probably not true. His name, it is said, was Mustafa Parmo. The strongest theory revolves around a US soldier, an army chef called Nicos Harris who was wounded in the Second World War in France. 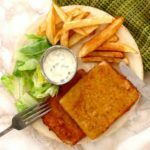 He recuperated in hospitals in England and then settled in Middlesbrough, where he opened the American Grill and began serving parmesans, as they were called initially, in 1958. It is said that he based his specialty on a dish he’d tasted in his childhood in the US in the 1930s, which was itself based on the parmigiana, a shallow fried breaded meat cutlet, often veal, which came from Parma in northern Italy. So the dish is not named because of parmesan cheese, which also comes from Parma, but because of the city. But in 2007, when Stockton held the first World Parmo Championships, another theory was put forward. One of the judges was Chef Charlie Constantine, of the Buck Hotel in Great Ayton who was hailed as the inventor of the parmo. 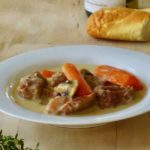 It was rumored that they could not get the veal in the 1960s, so they took the béchamel sauce from their moussaka and put it on a deep-fried pork fillet. Parmesan goes hard when you grill it, so that was replaced with cheddar. 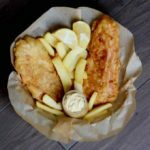 Pork and cheddar are the Teesside twists on the parmo, although its veal heritage can still be seen as most recipes and menus refer to an “escalope” of meat at its core. 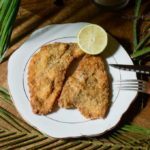 “Escalope” is a French word meaning shell, and in cookery circles it comes because since the early 18th Century, meat – usually veal – was cooked in a sauce in a shell-shaped pan. The parmo is also a rapidly evolving dish. For example, somehow it changed from cheap takeaway into a restaurant dish in a way the humble kebab has never managed. The first mention of it on a proper menu in the archives is from December 1993 when Mike Amos encountered a “pork parmesan” at The Talbot in Bishopton. That must also have been when the meat at the heart of the parmo was evolving once more. 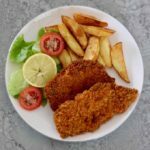 By the end of the 1990s, the dish that had started with veal had settled on an escalope of chicken as its preferred taste. And, of course, the name of the dish evolved. According to the Oxford English Dictionary, the first recorded usage of “parmo” as an abbreviation for “parmesan” was on May 7, 2003, in the Middlesbrough Evening Gazette, which for many months ran a parmo of the week column. Parmo though, was clearly in use years, perhaps decades, before that date. The dish was popularized after being made on MasterChef, a popular cooking television series. The parmo, a cult delicacy from the North East, has been described as “monstrous” by a leading obesity campaigner. Modern versions of the specialty, from Teesside, are most commonly made with chicken breast. Pork was originally used, according to locals. Indeed, to make a parmo, the meat is flattened, covered in breadcrumbs, and deep-fried until crisp and golden. It is finished with a layer of béchamel sauce and melted cheese. Not the most healthy specialty! Middlesbrough’s favorite takeaway item is said to contain more than 2,000 calories, more than a Cornish pasty, a Staffordshire oatcake with bacon and cheese, even a chicken tikka masala from Brick Lane in London! Just imagine most people consume 2000 calories with 3 – 5 meals, whereas parmo is one meal containing all 2000 calories! So you can see why parmo is considered an obesity monstrosity. You would have to be an Olympic athlete to eat it without effect; for the rest of humanity, there is an unbelievable risk of obesity. Whatever its backstory, the dish is famous in Teesside and fiercely defended by locals. The Mayor, Ben Houchen campaigned for the parmo to receive Protected Designation of Origin Status. His plans were labelled “irresponsible” by critics. 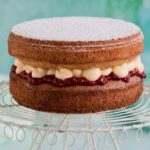 MasterChef contestant Anthony O’Shaughnessy brought the food to a wider audience after cooking it on the latest series of the show. 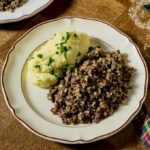 Judges John Torode and Gregg Wallace loved it – and Mr O’Shaughnessy thinks issues of obesity are about much more than a single dish. Let’s get one thing straight. A formed chicken escalope, topped with cheese might taste okay but it is not a parmo. What’s more, if a recipe uses tomato sauce instead of béchamel, then that’s not a parmo either. It’s a parmigiana, parm, parmi or parma (depending on whether it is Italian, American or Australian). That’s right, our friends down under have a similar obsession with this dish but they’ve never tried switching out the red sauce for the white – that is something unique to Teesside. Parmos can be made with any flattened meat fillet. 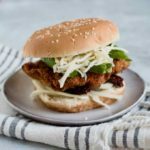 Pork is seen as the traditional option but most people these days seem to prefer chicken. The meat is flattened and breaded to make a schnitzel, which is then cooked and topped with béchamel sauce and melted cheese. 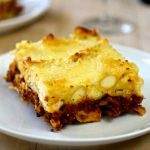 Methods vary but as a general rule of thumb, the cheese shouldn’t release too much oil when melted, the béchamel should be creamy and silky smooth and the chicken should be moist and not beaten too thinly. Try to buy better quality meat too because it really does make a difference. The same goes for the cheese – try to find independently produced mature Cheddar or red Leicester. Teesside is a cosmopolitan place, so the parmo is a cosmopolitan dish: béchamel sauce is named after a marquis’s, Louis de Béchamel (1630-1703), who was chief steward to the French King Louis XIV. Béchamel perfected a traditional French white sauce recipe – butter, flour, and milk and possibly cream – and so it still bears his name. What are the variations of parmo? – Parmo hotshot: chicken or pork topped with cheese, pepperoni, peppers, garlic butter and chili. 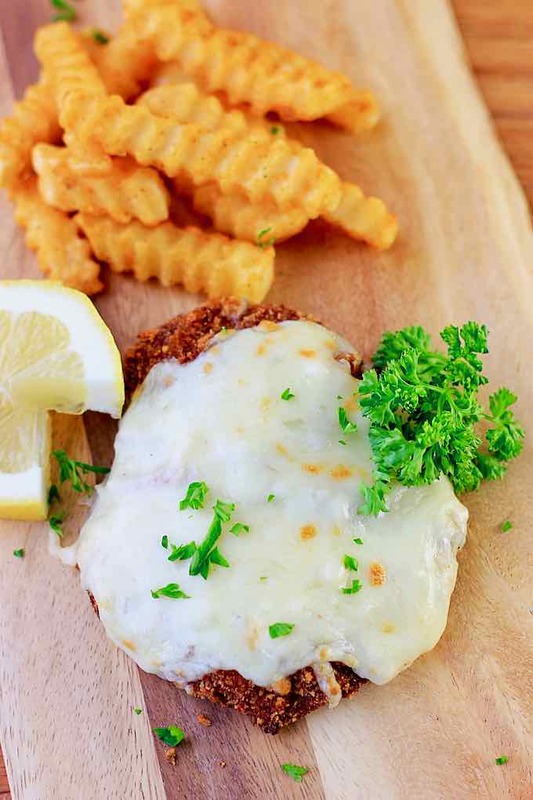 – Parmo Kiev: chicken only topped with cheese, garlic butter, and mushrooms. – Parmo Italia: chicken or pork topped with cheese, garlic butter and ham, with a further topping of mozzarella cheese. – Meat feast parmo: chicken or pork topped with pepperoni, chicken and ham. 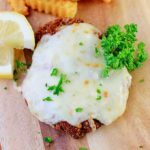 – Parmo Zeno: chicken or pork topped with cheese and onions. Due to its size, a full parmo is usually served in a pizza box with any accompanying chips and salad, although a large round polystyrene tray is also common. So will the next chapter in the history of the parmo see it getting Protected Designation of Origin status from the European Union, just like Cornish pasties, Wensleydale cheese and Melton Mowbray pork pies? Who knows? 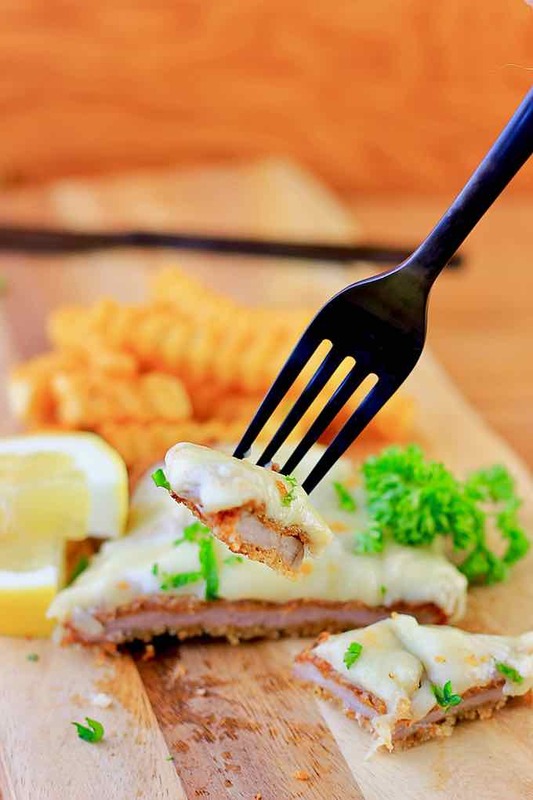 What we do know is that when you take a bite out of a crispy, breaded pork fillet, pair it with a dab of béchamel sauce, you get one of the most gratifying food experience to grace your taste buds! Parmo is a popular dish from Middlesbrough in England that is made of breaded pork topped with cheddar sauce, which is similar to schnitzel. 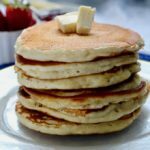 In a non-stick pan, melt the butter over low heat. Add the flour and stir continuously until smooth. Add the boiling milk gradually to the butter and flour mixture, whisking continuously until smooth. Reduce heat and simmer for about 5 to 10 minutes, stirring constantly, until obtaining a smooth sauce. 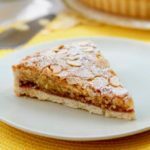 Remove from heat and season with salt and nutmeg. Cover the sauce with plastic wrap (the plastic wrap needs to touch the surface of the sauce) and reserve it. Using a mallet, beat the slices of pork tenderloin between two sheets of parchment paper until they are flat and thin. In a shallow bowl, beat the egg vigorously. Pour the bread crumbs in a separate dish. Coat each slice of pork with the beaten egg, then dip in the bread crumbs, covering them evenly. Heat a large pan of vegetable oil until the oil reaches 320 F (the temperature of the oil is important). Fry the pork on both sides until golden brown. Deposit the pork on paper towels. To serve, pour the bechamel sauce over the pork tenderloins and sprinkle the cheddar cheese on top. Place under the oven grill on medium heat until the cheese is melted and lightly browned.